We are excited to share the following information with you about the Music Department at Mount Saint Mary’s University, Los Angeles. “Do you want to apply for a scholarship?” for instructions. at 310-434-4290 with any questions. The JVS Scholarship Program, is a need-based program providing scholarships for college and graduate school for Jewish students who are permanent residents of Los Angeles County. The online application for the 2019-2020 academic year launches January 1, 2019, and closes March 31, 2019. Since 1972, Jewish Vocational Service has awarded over $9.2 million to more than 4,900 financially challenged Jewish students from LA county pursuing higher education. More information is available on our website, www.jvs-socal.org. Hong Kong Schools Alumni Federation Scholarship Foundation is a non-profit tax-exempt organization incorporated in California in 1996. This year, up to 5 awards of $2,000.00 will be offered to high school seniors. Recipients are also eligible to apply for a Hong Kong Study/Internship Scholarship during the course of the undergraduate program for an amount up to $3,000.00. Students with a minimum cumulative GPA of 3.5 and who are in financial need are welcomed to apply. Please visit our website www.hksaf.org to download the Criteria and Application Form. The Los Angeles Trial Lawyers’ Charities, will award ten (10) $2,5000 scholarships—a total of $25,000--to 10 deserving high school seniors who will enroll in a four-year college or university in 2019. LATLC’s mission is to make a positive difference in the quality of life for people within the greater Los Angeles area, focusing on issues related to education, children, survivors of abuse, people with disabilities, and homelessness. Please see Ms. Bryan for a nomination by April 1st. The deadline for applications will be APRIL 15, 2019. The initiative behind the Angels Wings Thai Scholarship, West Coast Region, is to recognize and honor Thai-American students who have demonstrated academic excellence, concern for and involvement in their Thai community and the desire to continue and further their education. The AWF Scholarship Committee will select 30 undergraduate students to receive a $5000.00 scholarship for city/community college and $10,000.00 scholarship for a four year college. Interested applicants may apply by completing and submitting the application by May 1, 2019 by 5:00pm PST. The California Legislative Black Caucus (CLBC) Scholarship Program was established to assist deserving students by offering financial assistance to help meet educational expenses. This program provides tuition assistance to enable students to fulfill their higher education goals. Scholarship candidates must be full-time students in good academic standing at an accredited college or university. Graduating high school seniors with written proof of acceptance at an accredited institution of higher learning are also eligible. The deadline to submit the scholarship application is Monday, April 8, 2019. 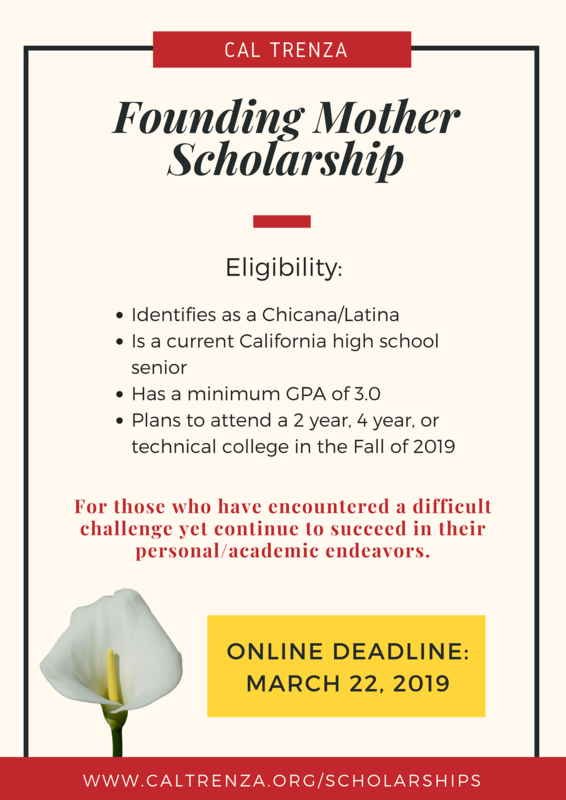 The California Latino Legislative Caucus Foundation (CLLCF) is pleased to invite all qualified California residents to apply for a scholarship. This scholarship program was established to assist deserving students by offering financial assistance to help meet educational expenses. Submit a completed application along with all required supplementary documents by the application deadline. The deadline to submit the scholarship application is Monday, June 1, 2019. The Herb Alpert Music Center at Los Angeles City College (LACC) is excited to announce that we are now accepting applications for The Herb Alpert Scholarship for Fall 2019. Students who apply and specify that they are planning to transfer to a 4-year institution OR complete an AA degree in Music can audition for the Herb Alpert Music Academy (Applied Music Program) which provides students with individual lessons in their area of emphasis and enables them to complete their first two years of a bachelor’s program at LACC. However, Students who decide to focus on a Commercial Music Skills Certificate in Music Technology, Performance, or Composition are also eligible for the Herb Alpert Scholarship. 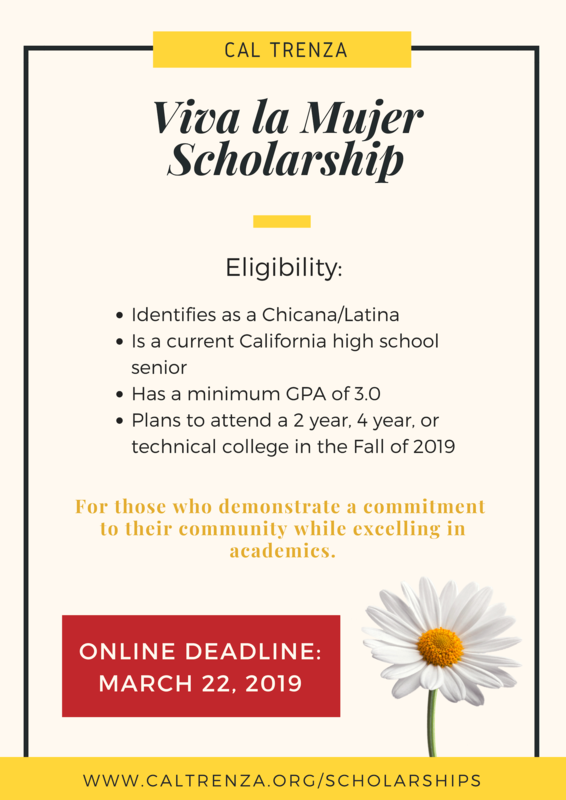 The priority deadline to ensure a scholarship is April 26, 2019. Friends of Project 10 invites Southern California senior high school students to apply for the Models of Excellence Scholarship . Awards are made at $1,000, $2,000 and $3,000 levels to those students who have advanced LGBTQ civil rights. Applications due Saturday, May 11, 2019. The Cuban-American Teachers’ Association (CATA) is offering a scholarship to high school students of Cuban descent who are planning to continue their education at the college level. The applicants should have at least a ‘B’ average in their high school course work, be active in school and community affairs, speak acceptable Spanish and demonstrate an interest in their cultural heritage. The scholarship has a cash value of five hundred dollars. Are you a student whose parent(s) have been fatally or seriously injured on the job? Every year, thousands of California workers are seriously injured at work and more than 350 are killed. These events can devastate families. Part of the fallout can include a significant reduction in income that makes paying for college or vocational school seem out of reach. Kids’ Chance of California is a 501(c)(3) non-profit charitable organization whose mission is to provide needs-based educational scholarships to the children of California workers who have been fatally or seriously injured on the job. We believe we can make a significant difference in the lives of all children affected by a workplace injury by helping them pursue and achieve their educational goals. We are thrilled to announce that Kids’ Chance of California is currently accepting applications for scholarships for the academic year 2019. For students attending college in the fall 2019, our application deadline is May 15, 2019. For detailed information on eligibility and what the scholarship covers click here. To download the application visit Kids’ Chance CA Application. or two (2) year college or university. Participation and leadership in community service. Application available at www.lfia.org or in the College Center. Latino Equality Alliance is proud to collaborate with SOCAL Gas to offer a $5,000 scholarship for LGBTQ+ and ally students who are pursuing a STEM degree. Students that have demonstrated commitment to advancing the LGBTQ+ movement are encouraged to apply. Application Deadline: April 8th, 2019 at 11:59PM. The Tau Beta Omega Chapter of Alpha Kappa Alpha Sorority, Inc. is awarding scholarships to graduating High School Seniors committed to attending a Historically Black College or University in the Fall of 2019.